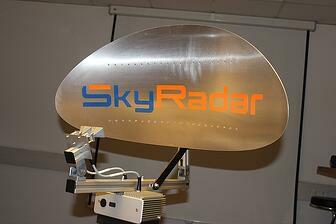 Universities use the SkyRadar’s modules to teach and to conduct research. Universities traditionally focus on SkyRadar’s Primary Surveillance Radar modules (PSR). They use the PSR Base Module and the Pulse Extension in their practical seminars to introduce into specific radar approaches and include the relevant modes such as Doppler, FMCW or Frequency Shift Keying. All relevant scopes are included (A-Scope, B-Scope, Raw Data Scopes, Plan-Position- Indicator PPI), as well as methods like the Sensitive Time Constant Method STC, Moving Target Indication MTI or Moving Target Detection MTD. From the verification of the radar equation up to the experimentation on most complex scenarios, the SkyRadar PSR modules offer the correct experimentation environment for laboratory and outside experiments. The SAR module allows experimenting synthetic aperture radars to increase radar resolution. Remote controlled targets and aircrafts provide the targets required to provide sophisticated training. But beyond the teaching and education focus, SkyRadar’s openness allows for research, e.g., in the context of PhD projects. New analysis algorithms can be deployed and verified. The system’s reach (500m) and its safety to human users (beam power far below a mobile phone) allow for continuous operation and measurement implementations. SkyRadar’s solutions can be applied to operate permanently to acquire the data, which researchers as well as PhD students or master students can use for their investigations. Standard Interfaces, readable by MATLAB and other academic tools are part of the standard system. SkyRadar supports academic work and publications. We do not restrict academic publications, even though they refer to or describe our technology or architectures. Upon request of our customers, additional information is provided to strengthen the academic validity of the results. In addition, we feature those results on our Website and in conferences (with reference to the researcher and university). Students can download and use SkyRadar’s Data Analysis and Visualisation tool SkyRadar OpenNavigator free of charge.